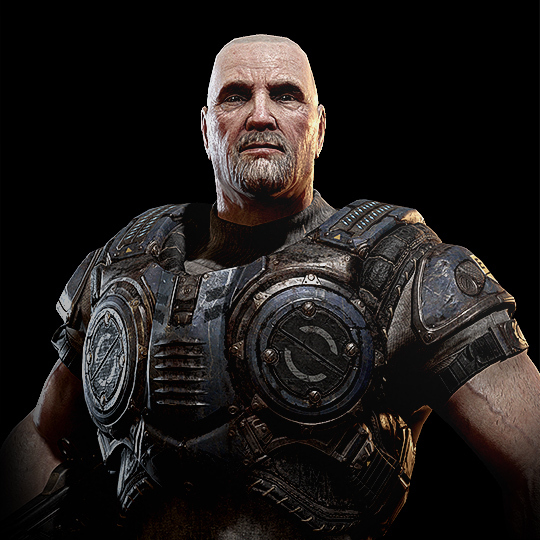 Adam Fenix is the father of Marcus Fenix. He's also a retired Major and a COG military scientist who helped win the Pendulum Wars by inventing the Hammer of Dawn. He only had one child with his wife, Elain before she disappeared when Marcus was 13. He had a formal and cold relationship with his son right up until Adam was crushed in the rubble of a Locust attack in 10 A.E. and Marcus was thrown in jail for dereliction of duty when he left his post to rescue his father. Marcus assumed his father was dead for seven years, but he was alive and hidden on Azura by Chairman Richard Prescott. But long before his supposed death, Adam spent years trying to make amends for not stopping the Locust attack on Sera. Before Emergence Day, Queen Myrrah asked Adam to help the Locust kill the Lambent that were forcing the Locust out of their underground home. Adam failed to do this in time and the Locust had no choice but to stake claim on Sera's surface by killing its humans. Seventeen years later in Azura, Adam finally created the Imulsion Countermeasure Weapon, which targeted Lambent cells caused by Imulsion. The weapon destroyed the Lambent and the Locust, but also killed Adam in the process. Marcus was heartbroken.